Took me some time to get this one. 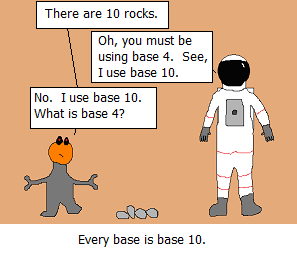 Basically every base is called 'base 10'. Even though the alien actually does count in what we would call 'base 4'. The alien would still call it base 10. This makes more sense when we count in different bases. Why all the Sonic commercials?